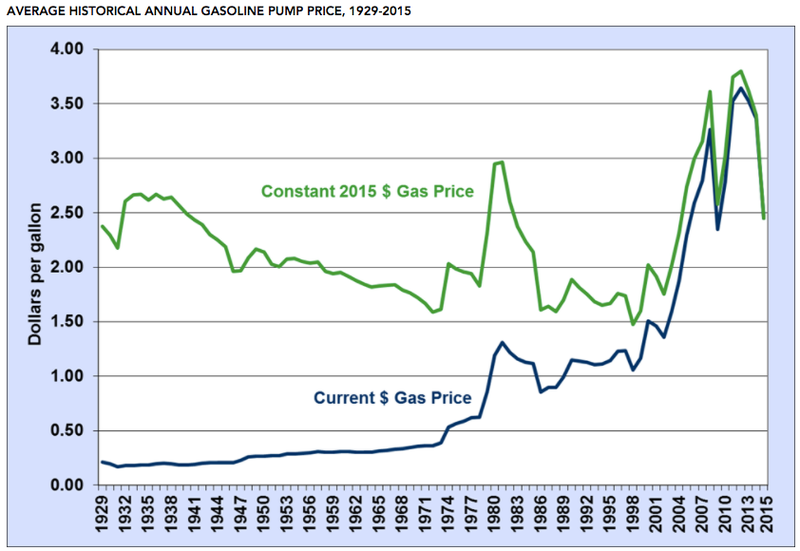 I just discovered that the price of gasoline in constant dollars was just 7 cents higher in 2015 than 1929. Knowing that our average daily wage has risen substantially since then, we can say that our gasoline purchasing power has soared. Where are we going? To a current look at worldwide purchasing power. Bloomberg just published its look at gasoline prices in 61 countries for the third quarter of 2016. The message? There are vast differences in a worker’s purchasing power. Somewhat similarly, using data from 2007, a Princeton economist calculated and then compared the number of Big Macs that an hour of work would buy in 60 countries. Predictable, the results were also fascinating. In 2007, a McDonald’s employee in the U.S. could buy 2.41 Big Macs after an hour of work while someone in India’s McDonald’s needed close to three hours for just one. It can be tough to compare wages around the world. Lots of people could be called iPhone assemblers or auto workers or t-shirt makers. But, depending on the country, factory conditions, time off, the work day, all really differ. So, recognizing the vulnerability of our data, we can cite some stats that display the huge different in living standards. An Indian worker’s daily wage buys 80% of a gallon of gasoline and close to 3 Big Macs. Seeing slightly more affluence, we have 6 gallons for China and 4 Big Macs. 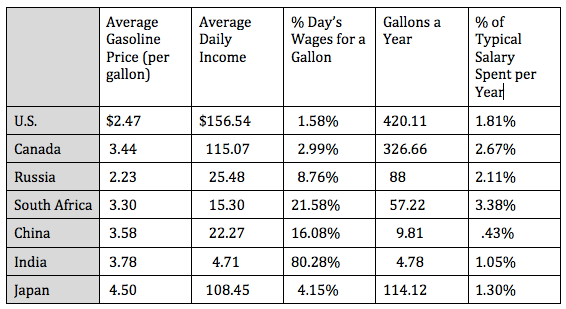 Then leaping to the developed world, in the U.S., Canada and Japan, one day of work could pay for anywhere from 24 gallons to 63 gallons of gasoline and 24 or so Big Macs. My sources and more: Having seen the Bloomberg summary of gasoline prices, I recalled Dr. Ashenfelter’s study in this NBER working paper. For much more detail, I recommend a look at both. The Bloomberg data is interactive. You can see prices in the currency of each of the 61 countries. Meanwhile, the Princeton paper is not only contemporary but gives us some historical perspective. Both are superb sources of data and insight. Please note that this post was edited to improve clarity after it was published.